LinkedIn got on stage at the recent CEB Summit to talk with members about how LinkedIn is transforming sales teams through social selling. Our insights show that salespeople's social media use is increasing quickly and across many different industries. The tech industry is leading the charge but it's followed closely by some industries not traditionally perceived as "social businesses" like oil and energy and even chemicals. That data is impressive on its own, but what made the audience really lean forward was the data we cross-referenced with the actual CEB attendees. CEB attendees are performing at a much higher rate than the average. This is a testament to the adoption of LinkedIn by progressive companies using the platform for sales. 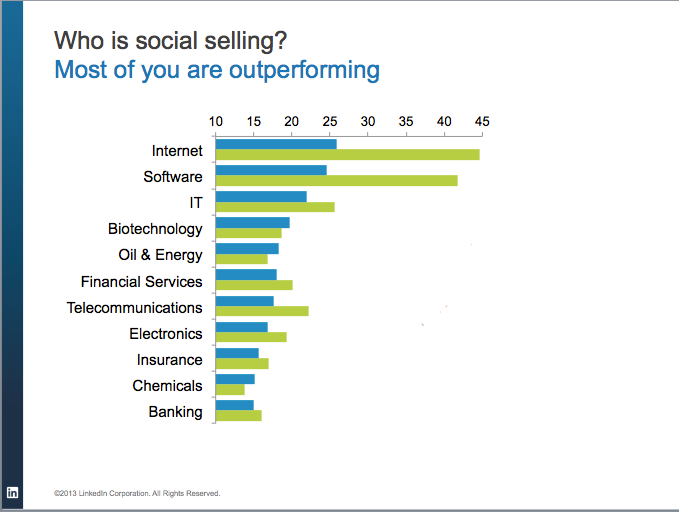 The graph shows the average Social Selling Index score (blue bar) of sales professionals in specific industries. When this data was isolated to the sales professionals list of CEB event attendees (green bar), it became very clear that CEB attendees were out-performing their B2B sales peers in most cases. Another key point reinforced by CEB's own leadership was that the need for a multi-threaded sales approach is more important than ever in B2B sales. Sales professionals need to be better at managing multiple contacts in an organization. CEB research shows that the average B2B opportunity involves 5.4 decision makers. If you are only focusing on one person within that opportunity, you're going to lose it. 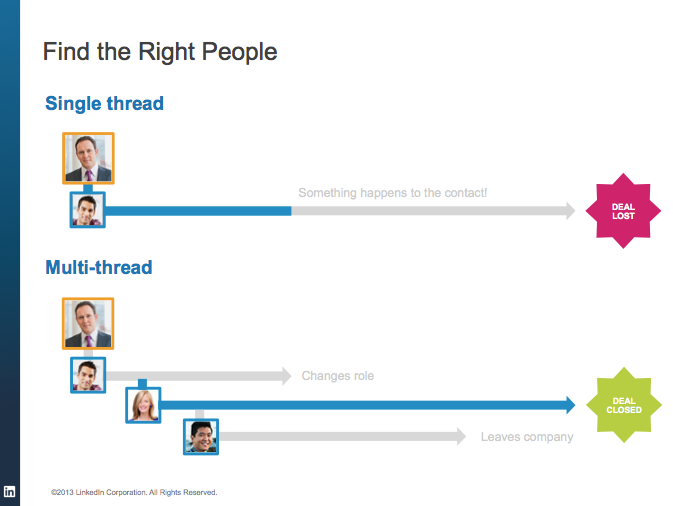 LinkedIn Sales Navigator gives sales professionals the ability to leverage their corporate network with its TeamLink tool to identify any connections they may have with people in the prospect company.